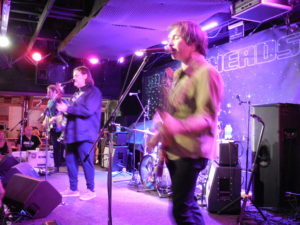 On a steamy, mid-week summer evening just northeast of downtown Kansas City, Matthew Sweet and Tommy Keene packed the indoor stage at Knucklehead’s Saloon. Tucked away in an industrial railroad district near the Missouri River, Midwestern fans anticipated the return of these two power pop legends. 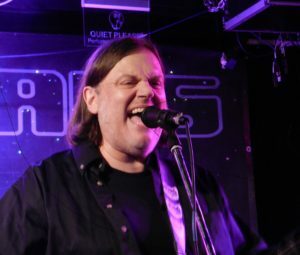 Matthew Sweet recently released his twelfth studio album Tomorrow Forever, which was funded by a very successful Kickstarter campaign, his first record with new original music since 2011. During the process of this album, Sweet moved back to his home state of Nebraska and dealt with the loss of his mother. While it took nearly three years to complete, he ended up with over three-dozen possible songs for the album. Opening the show was critically acclaimed singer-songwriter Tommy Keene, one of power pop’s godfathers with a longtime cult following that dates back to the early 80s. 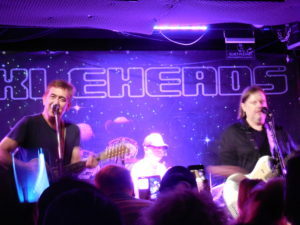 Following Tommy’s set of well-crafted songs, Matthew Sweet and his band entered the stage in front of an energetic audience of about 250 people. For this particular tour, he was joined by The Dream Syndicate’s Jason Victor on guitar, Velvet Crush’s Paul Chastain on bass, and long-time collaborator Ric Menck on drums. Sweet opened with the rocker “Time Capsule” from 1993’s Altered Beast, and they picked out tunes from six of his other records. His classic album Girlfriend from 1991 was the most predominant which included such songs as “Winona,” “Divine Intervention,” “You Don’t Love Me,” “I’ve Been Waiting,” and of course the title track “Girlfriend.” In addition, Matthew played four new songs that also received a great ovation. While there wasn’t much chatter with the audience between songs throughout the 90-minute set, he made it clear at one point that the band would be making a stop at Joe’s Kansas City BBQ before hitting the road in the morning, bringing the audience to a giant applause! To finish out the main set, Tommy Keene joined Matthew Sweet for the last two songs including one of Sweet’s biggest hits “Sick Of Myself” from 1995’s 100% Fun. The encore included three more songs, closing with one of my personal favorites “Devil With The Green Eyes.” Some casual fans might only recall a handful of his songs that were on the radio or MTV, but Matthew Sweet proved again that he is one of the power pop legends of the nineties, packed with some of the most melodic rock & roll of his era. ***Update: Tommy Keene passed away from natural causes at the age of 59 on November 22, 2017, making this tour his last set of performances of his career from July through September 2017.